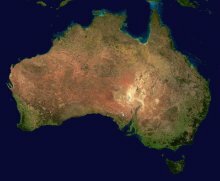 In this section we cover interesting information and facts about Australia geography. The mainland of Australia is not only the largest island in the world but also the flattest and the smallest continent. Australia is the only country which is also a whole continent. Australia is the sixth largest nation in land area after Russia, Canada, China, The U.S.A. and Brazil. Mainland Australia covers an area of 7.69 million square kilometres. It spans approximately 4000 kilometres from east to west and 3700 kilometres from north to south and has a coastline 36,735 kilometres long. The most northern point on the Australian mainland is the Cape York Peninsula in far-north Queensland. The most southern point on the Australian mainland is at the tip of Wilson's Promontory in Victoria. The most eastern point on the Australian mainland is Cape Byron just east of Byron Bay in northern New South Wales. The most western point on the Australian mainland is Steep Point a short distance from Shark Bay in Western Australia. Australia is the lowest continent in the world, averaging only 330 metres. The lowest point is Lake Eyre in South Australia which is 15 metres below sea level. Australia is the driest inhabited continent on earth (Antarctica is the driest). A large part of our Australia geography is made up of deserts, in fact nearly 20% of Australia is made up of 10 deserts. The Great Victoria Desert located in Western Australia and South Australia is the largest at 348,750 square kilometres. The Great Sandy Desert is located in Western Australia and is 267,250 square kilometres. The Tanami Desert is located in Western Australia and the Northern Territory and 184,500 square kilometres. The Simpson Desert is located in the Northern Territory, Queensland and South Australia and is 176,500 square kilometres. The Gibson Desert is located in Western Australia and is 156,000 square kilometres. The Little Sandy Desert is also located in Western Australia and is 111,500 square kilometres. The Strzelecki Desert is located in South Australia, New South Wales and Queensland and is 80,250 square kilometres. The Sturt Stony Desert is also located in South Australia, New South Wales and Queensland and is 29,750 square kilometres. The Tirari Desert is located in South Australia and is 15,250 square kilometres. About 70 per cent of Australia is arid or semi-arid. 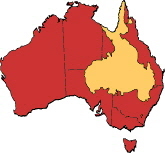 A large part of the centre of Australia is unsuitable for settlement. The longest river in Australia is the River Murray at 2375 kilometres. The tallest waterfall in Australia is Wallaman Falls at 305 meters located west of Ingham in Queensland. The Great Artesian Basin is an amazing part of Australia geography; located beneath the arid and semi-arid parts of Queensland, New South Wales, South Australia and the Northern Territory covering an area of over 1.7 million square kilometres (approximately 22% of Australia) is one of the largest underground water reservoirs in the world. Great Artesian Basin Coordinating Committee: Visit their website to find out more about the Great Artesian Basin. The geography of Australia includes the Great Dividing Range and its mountains which seperates the dry interior of Australia from the coastal areas. The highest mountain on the Australian mainland is Mount Kosciuszko which is located in southern New South Wales near the Victorian border (it is about 6 hours drive from Sydney and 8 hours drive from Melbourne.) Mount Kosciuszko is 2,228 metres. The highest Australian point is Mawson Peak at 2,754 metres which is on Heard Island (Heard Island is located in the Southern Ocean, about 4,000 kilometres south west of mainland Australia) and although it is not on the mainland it is still part of our Australia geography. Australia has seven territories not located on the mainland but as territories of Australia I have included them in our Australia geography section. These territories are located within the Pacific Ocean the Indian Ocean the Southern Ocean and the Coral Sea. The Australian Antarctic Territory covering an area of almost 5.9 million square kilometres is the largest of these territories. Norfolk Island which comprises Norfolk Island, Phillip Island and Nepean Island is located in the Pacific Ocean and has an overall area of just over 37 square kilometres. Heard and McDonald Islands are located in the Southern Ocean. Heard Island covers an area of 368 square kilometres. The McDonald Islands are small in comparison with the main island of the group being only 2.45 square kilometres. Cocos (Keeling) Islands Territory is located in the Indian Ocean and is series of 27 coral islands formed into two large coral atolls covering a total land area of 14 square kilometres. Coral Sea Islands Territory as the name suggests is located in the Coral Sea and is made up of many small islands spread over an extensive area although the coral and sand islands are quite small and the total area of all the islands is only seven square kilometres. Ashmore and Cartier Island Territory is located in the Indian Ocean and Timor Sea and covers an area of 2 square kilometres. 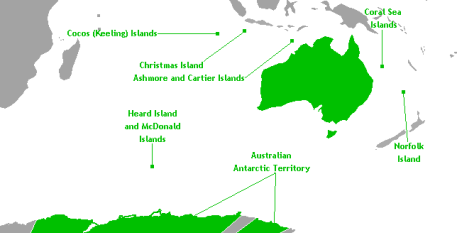 Christmas Island is located in the Indian Ocean and covers an area of 135 square kilometres. Australia geography is full of great contrast and spectacular scenery with its vast desert regions, beautiful rain forests, lush grasslands and wonderful mountain regions.